I am having problems making a table fit my page. I have used the tabularx environment and the \linewidth parameter, which successfully shortens the width of the \cline, but doesn't force the text to wrap so the table still falls off the page. 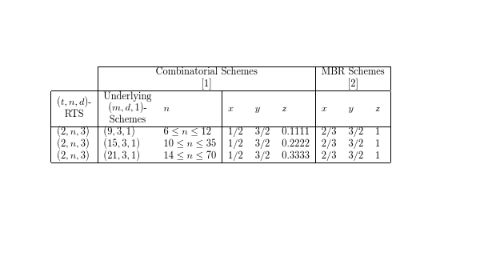 Ideally, I'd like the headings '(t, n, d)-RTS' and 'Underlying (m, d, 1)-Schemes' to wrap and make the table slightly slimmer. Please see below for an example. Any help would be appreciated. I've never had any issues with making tabularx and \linewidth work, but don't tend to use \multicolumn that often... is tabularx conflicting with \multicolumn somehow? I would never use tabularx for such a table, also in $n$-foo the - should be a text hyphen, not a minus. Not the answer you're looking for? Browse other questions tagged tables tabularx width cline or ask your own question.